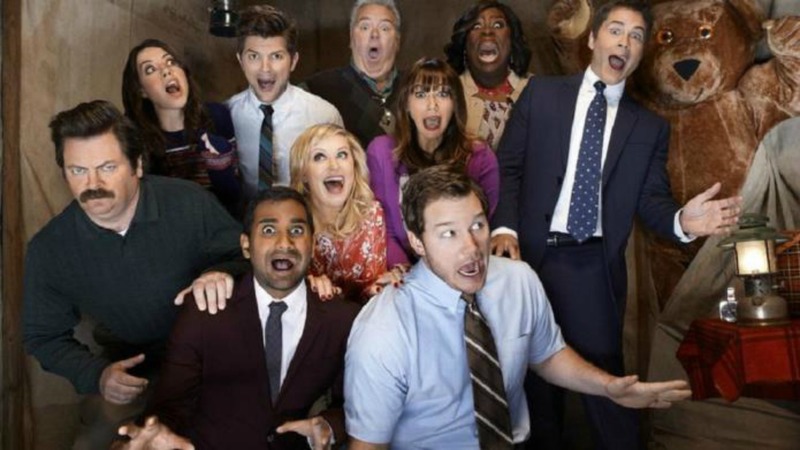 On Thursday, the Parks and Recreation cast came together for a very special reunion — and we caught all the feels, all over again. Stars Amy Poehler, Nick Offerman, Rashida Jones, Adam Scott, Aubrey Plaza, Chris Pratt, Rob Lowe, Retta, Aziz Ansari and Jim O’Heir celebrated the show’s tenth anniversary of its premiere date. The setting was a PaleyFest panel hosted by massive Parks and Rec fan, actor Patton Oswalt. Creator Mike Schur was also on hand as the group dished on the show’s acclaimed seven seasons on the air. The actors laughed as they shared never-before-heard tales from the set — and fielded rumors of a reunion. Dare we dream? What about a musical revival? A Geico commercial? We’ll take anything, guys. Come on. Schur didn’t say “sure,” like we were hoping. While he acknowledged that “nothing is ever gone” in an era of reboots and remakes, he remarked, “We would all have to feel like there was a story that needed to be told” still. “The show was about the power of public service and doing good with a team. I don’t think we left anything on the table,” he said. That doesn’t sound too promising for Parks addicts, alas. The actors covered plenty of ground. They riffed about the catchphrases birthed on the show, especially “Treat yo’ self,” now omnipresent in social culture. Not everyone loves the phrase. “Try walking into Target and seeing ‘Treat Yo’ Self’ everywhere! It’s obnoxious,” Retta (who played Donna Meagle) said. Relationships between the characters were a main focus of the panel discussion, naturally. We weren’t surprised at all to learn that Ben (Scott) and Leslie’s (Poehler) engagement was a super emotional experience for the actors and the creative team, who dumped the “documentary style” for the proposal scene. Poehler confessed to actually being “nervous” to film it. “We [Scott and Poehler] stayed away from each other on set [that day],” Poehler said. Scott added, “I remember [during] the hiatus before that season, talking about how we wanted them to get married.” Dang, they shipped themselves as Ben and Leslie. Now that’s cute. Aubrey Plaza, for her part, said that she deserves all the credit for apathetic April and Tigger-like Andy (Pratt) winding up together. “It was my idea,” she deadpanned to the audience. She told the crowd she had originally decided to play her character as mysteriously drawn to Andy when in season one, April became oddly interested in Andy’s band, Mouse Rat. Pratt sweetly described the characters’ love story as that of a “cat and a dog.” In season two, Andy and April stay behind to watch over the office in the episode “Hunting Trip” — and wind up married the next season. We hope they gave out free tissues at Paley Fest. One of the coolest things we learned about the show was that it was originally supposed to be a show about the tight friendship between Leslie and Ann (Jones). Both actors got teary-eyed discussing their onscreen bond (which reflects their IRL fierce attachment to each other). Women supporting other women — no wonder we loved, and still love, this show so damn much.